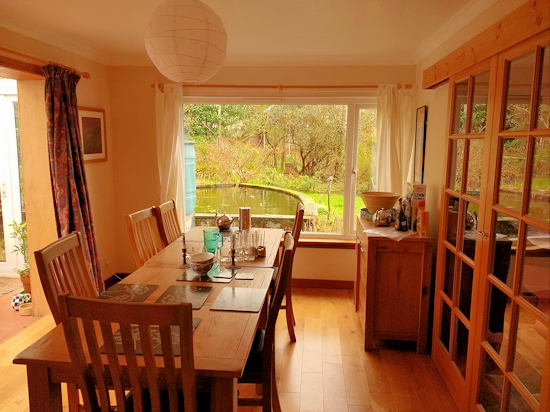 Penny & Mark invite you to Creagard, Bed & Breakfast, in Tobermory on the Isle of Mull. We have two en-suite rooms, newly furnished and decorated, one double and one twin. Each room has coffee and tea facilities, full wi-fi access and a Google Home mini. 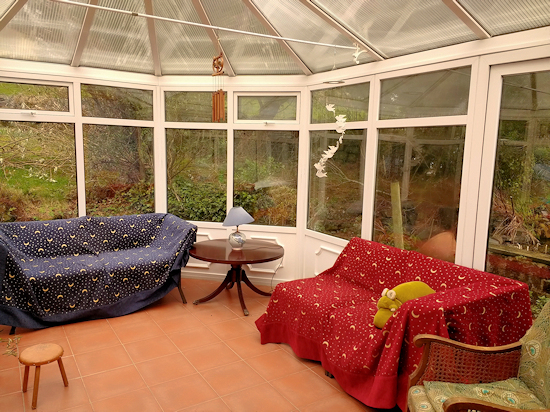 A conservatory is available for your use. We have ample parking and are a few minutes walk from the harbour. We don't have TVs in the rooms - take a break and enjoy the island! Our breakfasts use local produce and we are experienced in meeting dietary needs. Oh, and we're dog friendly too! Reduced rate for longer stays and single occupancy - please contact us. Please let us know of any dietary need when you book. The price quoted is per night. We offer a reduced price for every third night you stay. The discount for the third night is £20 - this is automatically applied when you book on line. Our regular Check-in time is from 4.30pm - 09.00 pm. If you would like to book in earlier, please ring Penny or Mark to make arrangements. We can cater for your dietary needs, just let us know when you book so we can ensure we have things you need. It is no-smoking indoors, please. We love having your dogs to stay. We ask that you do not allow your dog on the beds though. We'll be happy to show you the excellent walks here. We have a garden for your dog's needs and have a suitable supply of disposable bags. We ask for a 25% non-refundable deposit when you book online - but if there is a problem, please ring us. Your message is on it's way ... Oops, that didn't work. Please try again. Dolly, Mimsi and Nina look forward to meeting your dogs. 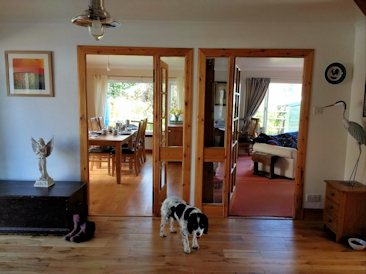 We have excellent walks from the door and a short drive from here. Use What3Words to find us! what3words gives every 3m x 3m in the world a unique 3 word address. This one describes the precise location of this vehicle. Click here to learn more.